Benjamin Reed, James Keegan, and René Thornton, Jr. in THE COMEDY OF ERRORS. Photos by LINDSEY WALTERS. 2014. 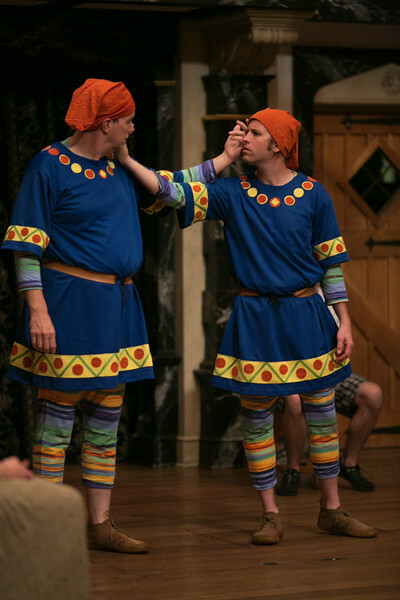 Gregory Jon Phelps and Chris Johnston in THE COMEDY OF ERRORS. Photos by LINDSEY WALTERS. 2014. 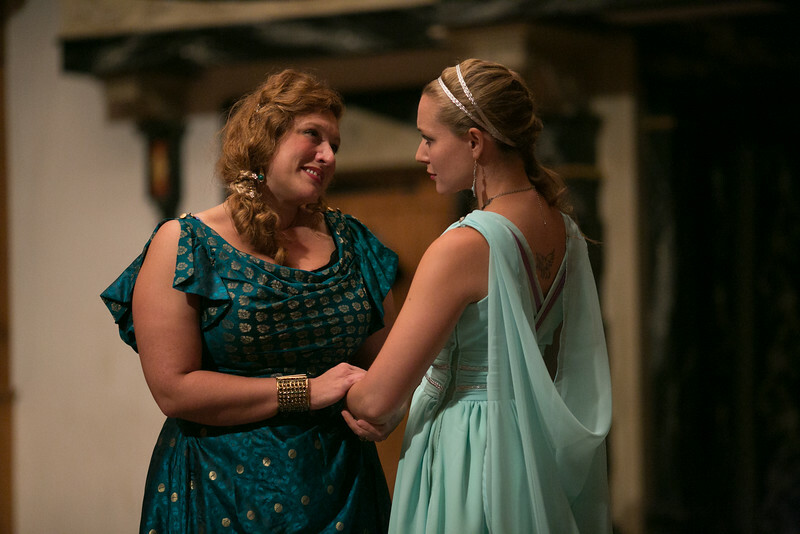 Allison Glenzer and Sara Hymes in THE COMEDY OF ERRORS. Photos by LINDSEY WALTERS. 2014. 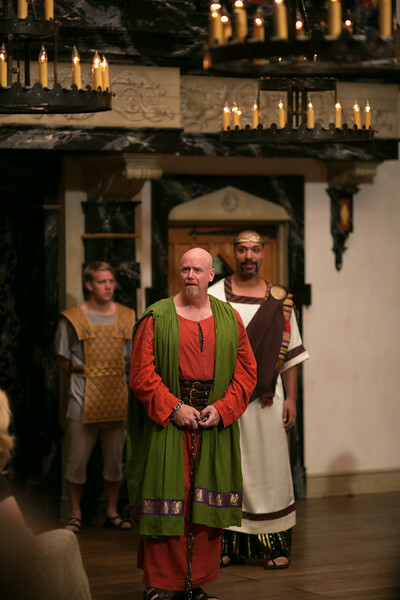 Gregory Jon Phelps and audience member in THE COMEDY OF ERRORS. Photos by LINDSEY WALTERS. 2014. 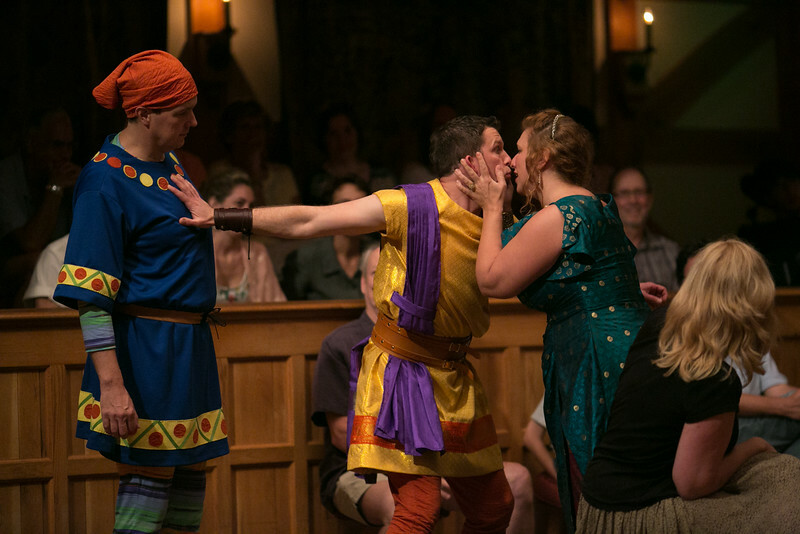 John Harrell, Gregory Jon Phelps, and Allison Glenzer in THE COMEDY OF ERRORS. Photos by LINDSEY WALTERS. 2014. 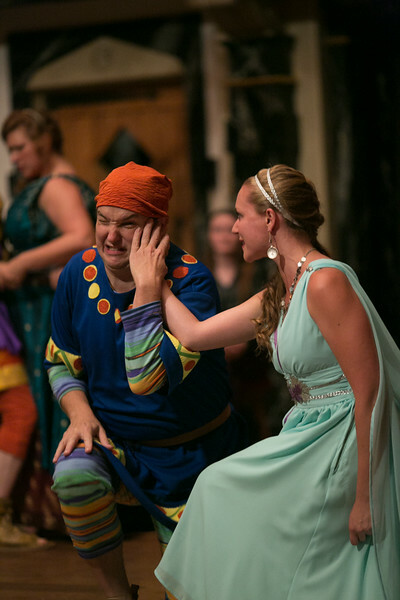 John Harrell and Sara Hymes in THE COMEDY OF ERRORS. Photos by LINDSEY WALTERS. 2014. 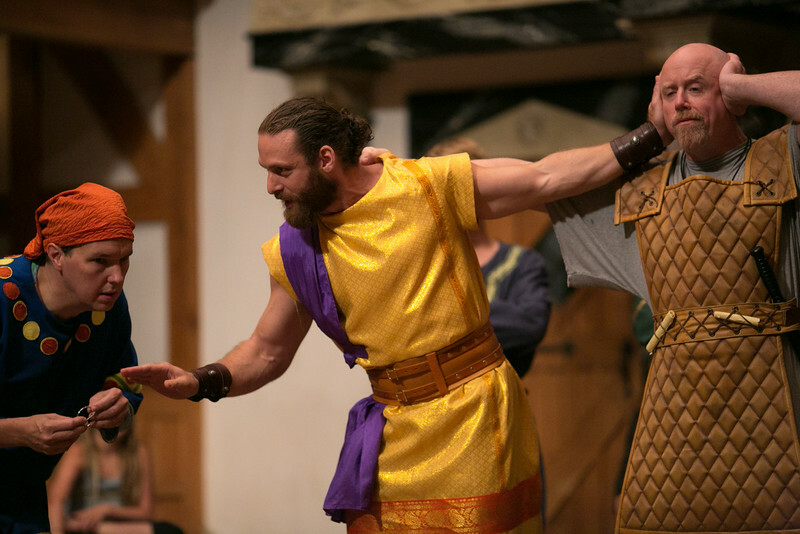 John Harrell, Jonathan Holtzman, and James Keegan in THE COMEDY OF ERRORS. Photos by LINDSEY WALTERS. 2014. 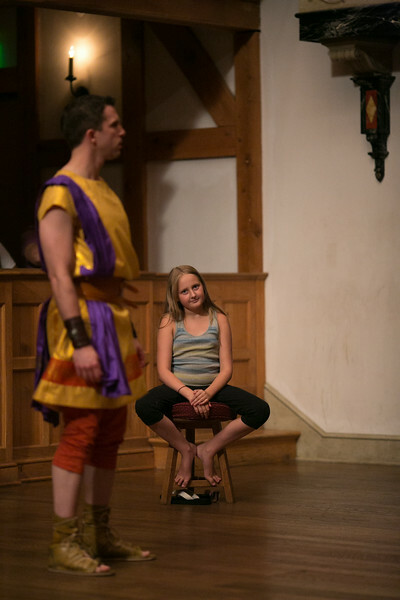 Jonathan Holtzman, René Thornton, Jr., and Allison Glenzer in THE COMEDY OF ERRORS. Photos by LINDSEY WALTERS. 2014. 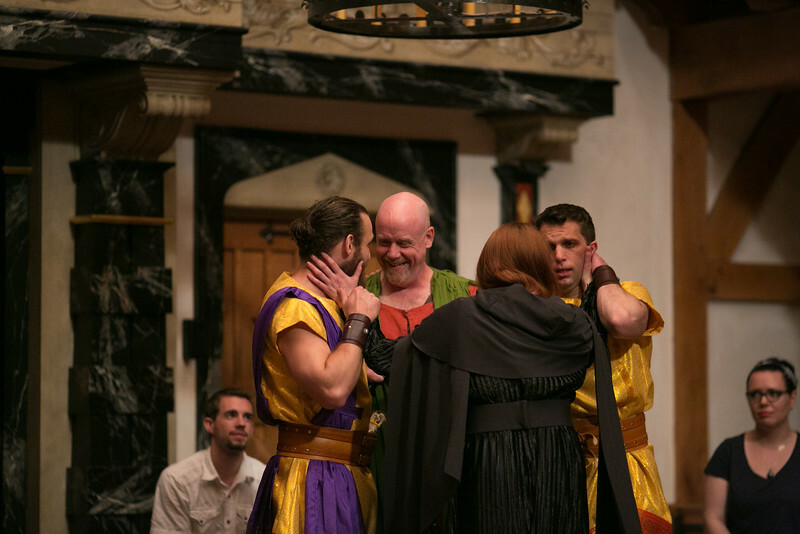 Jonathan Holtzman, James Keegan, Sarah Fallon, and Gregory Jon Phelps in THE COMEDY OF ERRORS. Photos by LINDSEY WALTERS. 2014. 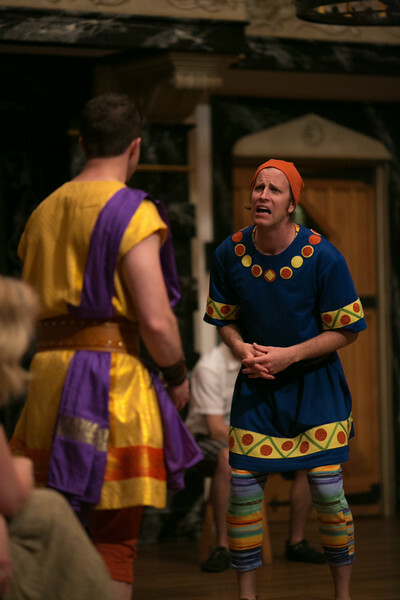 John Harrell and Chris Johnston in THE COMEDY OF ERRORS. Photos by LINDSEY WALTERS. 2014. Because of a feud between the cities of Ephesus and Syracuse, Duke Solinus (of Ephesus) condemns Egeon (a merchant from Syracuse) to death. Unknown to both Egeon and Antipholus of Syracuse, the other Antipholus lives in Ephesus with his wife Adriana, her sister Luciana, and his lifelong servant Dromio. Antipholus of Syracuse sends Dromio to secure their lodging. Adriana sends her Dromio to fetch her husband home to dinner. Confusions, mistaken identities, beatings, arrests, and errors ensue. The Comedy of Errors is one of Shakespeare’s early plays, and while it may not show the depth we find in his later plays, it certainly announces his genius. Shakespeare takes a comedy about twin brothers from the Third Century Roman playwright Plautus and squares the plot complications by adding a set of twin servants. The central joke of the play is that Antipholus of Syracuse and his servant Dromio, newly arrived in Ephesus, keep being mistaken for their twin brothers who, unknown to them, live in that city. Thus, Shakespeare set himself the logistical problem of having four characters interact with all the other persons of the play without letting the brothers in either set meet one another until the play’s finale. Performing this stunt with ease and economy, Shakespeare postpones the recognition scene by a series of ever more boisterious events that eventually involve the entire town. He peoples this ludicrous set up with character types familiar in broad comedy 700 years before Plautus. Among these stereotypes are the two Dromios, the beffudled clowns who reemerge in every generation from Truffaldino (The Servant of Two Masters) to Laurel and Hardy (The Music Box) to Jack Lemmon and Tony Curtis (Some Like It Hot) to Kramer and Costanza (Seinfeld). 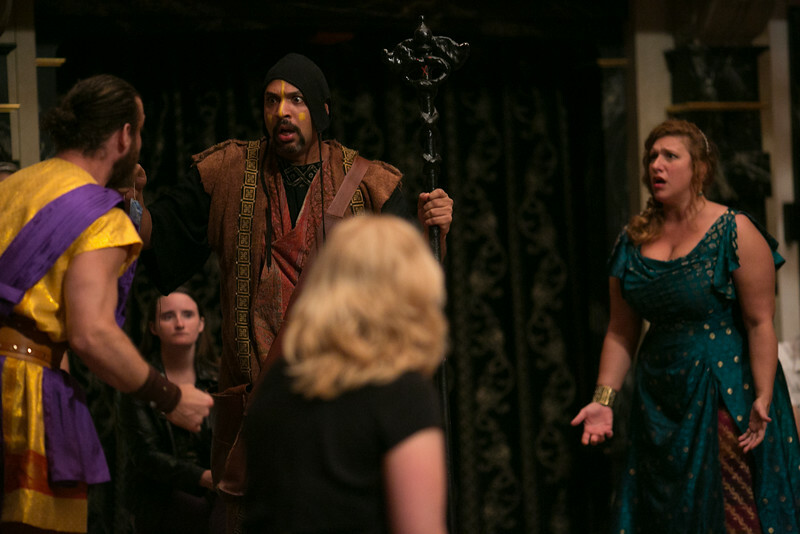 In short, Shakespeare’s play is the gold standard for the well-made farce. It entirely meets the obligation to be funny, so it needs no help from people like me who teach and write about Shakespeare. After all, funny is plenty good enough. Nonetheless, here is some help the play doesn’t need. Please don’t notice it. For the most part, the play is people with such comic stereotypes as foolish servants, the wandering husband, the matter-of-fact prostitute; but Adriana is not the typical shrew or a stereotype of any kind. She is much more the forerunner of Beatrice in Much Ado or Portia in Julius Caesar to Kate in Shrew, and her famous speech to Antipholus of Syracuse is a heartfelt plea from an unhappy wife to a neglectful husband. The speech is funny because she unknowingly gives it to the wrong man, but what makes it great comedy – and this is the secret of great comedy – is that she is not being funny. Finally, Shakespeare had a thing about twins. Two things that are similar but not the same – like his children Judith and Hamnet, like rhymes, like actors and the roles they play, like a script and the production of it, like comedy and tragedy, and like our own divided selves. That is deep. Think about it, but not tonight.